Will 2011 bring a new country for Africa? Africa is on the verge of adding another country, its first in nearly two decades. But perhaps not surprisingly, the new state will likely experience significant growing pains. Next January, the people of Southern Sudan should have an opportunity to vote in a referendum on whether to break away from the Republic of Sudan and create their own country. It is expected that the 8 million or so who live in the region will vote overwhelmingly for independence, according to The Economist. For the Sudan People’s Liberation Movement (SPLM), the vote will represent the culmination of half a century of often-bloody struggle for recognition against successive Islamist regimes in Khartoum. Northern Sudanese governments have often tried to impose an Arab and Muslim culture on the largely black African, Christian and animist south. By the time the fighting stopped in 2005, Africa’s longest civil war had cost 2.5 million lives and displaced many millions more. Much of the region was devastated, according to The Economist. The agreement that ended the war set up the semi-autonomous region of Southern Sudan, to be ruled by the SPLM, as well as a government of national unity in Khartoum led by President Omar al-Bashir, to include the SPLM. The two sides were to work for the country’s unity in a new federal arrangement but the south also won the right to a referendum on outright secession. But there are questions as to whether the Sudanese government in Khartoum will let the referendum proceed as planned. And even if it does, the outcome will be extremely messy. For example, while the Southern Sudan capital of Juba has received a makeover of sorts in recent years, the situation in the rest of region is still dire. 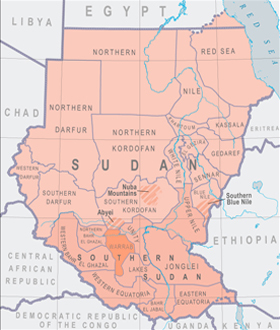 Some 85 percent of all Sudanese oil comes from Southern Sudan, and oil revenue constitutes more than 90 percent of Southern Sudan’s budget. However, according to the 2005 agreement, oil revenues are to be split equally for the duration of the agreement period. In addition, the region is composed of more than 200 ethnic groups speaking a variety of languages, which could hurt efforts at unity. Eritrea was the last African state to become an independent country, in 1993. It later fought a bloody conflict with Ethiopia, the country from which Eritrea broke free from. Even today, the border between the two nations is still disputed.